A memorial plaque in (the former) St Andrews Church, Henderson Road, Eastney. On the closure of the church it was moved to St Christopher's Chapel at the Royal Marines Barracks, Durnford Street, Stonehouse, Plymouth. 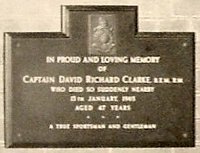 CAPTAIN DAVID RICHARD CLARKE B.E.M., R.M. "Captain David Richard Clarke. B.E.M., R.M. was my father-in-law. He was serving with P.R.O.R.M. that is Pay Records Office Royal Marines, which was situated at the Hutment Camp, known at that time as Melville Camp on Melville Road and demolished in 1976, and he lived in a house in Fort Cumberland; he died as a result of a heart attack on 13 January 1965, aged 47 years whilst on leave. His funeral was held at St Andrew's Church, he was cremated and his ashes were left in the church. It was not until 1997/8, that my late mother-in-law was informed that the plaque and his ashes had been removed from the church. After her death in 2004, my wife and I made enquiries with the Royal Marine Corp Secretariat and were informed that as they were unable to contact her, his ashes had been spread on the Memorial Gardens in front of the RM Museum and that his memorial plaque is now situated on the wall at the top of the stairs to the entrance of St Christopher’s Chapel at the Royal Marines Barracks, Durnford Street, Stonehouse, Plymouth PL1 3QS. The Royal Marine Museum [...] know very few names of those people. [...] only becoming aware of David Clarke’s name when we contacted them. Due to us being able to supply them with the necessary documentation his name has been entered into the Book of Remembrance in the Mountbatten Room at the RM Museum. The plaque reads that he was a "True Sportsman and Gentleman", this refers to the fact that he was an excellent hockey and tennis player, he represented both the Royal Marines and Royal Navy in those and other sports, being Captain of both hockey teams for several years. Since his death the Royal Marines have played an inter-corp hockey tournament for the Clarke Trophy, named after him."